We attend a small Catholic school run by nuns (although there are not too many of them! I’ve only had one teacher who is a nun). The retired nuns from the order that runs our school live in their own retirement home nearby, and our school has a service club that visits them every now and then, and sometimes they bring along cookies. We didn’t go for the visit, but we did make these cookies to send! 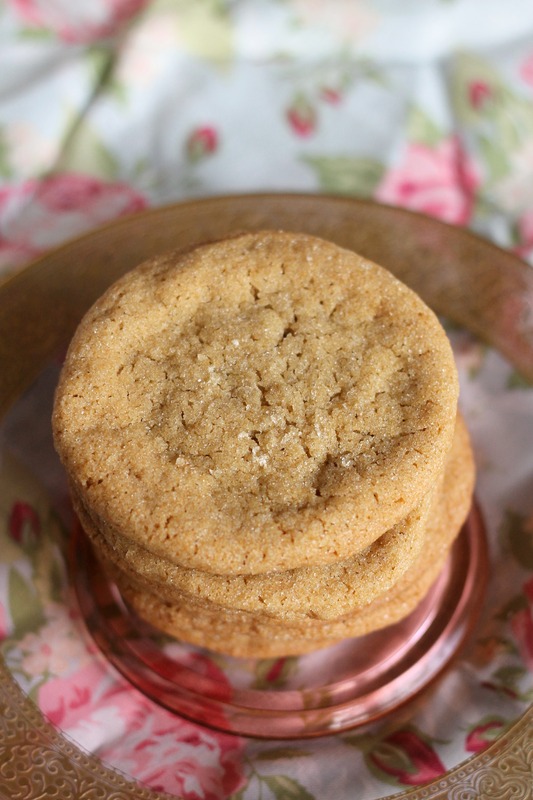 We love classic sugar cookies, but it’s enjoyable to try something new every now and then. These cookies are truly delicious. For a start, they have browned butter in them, which adds much more flavor than just plain butter. Also, they have a ton of brown sugar (no big surprise there, considering their name) which imparts a delicious caramel-like flavor into the cookie. They’re very sweet, so they are nice served with a cup of tea or coffee (or to leave out for Santa…he has a sweet tooth, you know!). In skillet over medium-high heat, heat 10 tablespoons butter until melted, about 2 minutes. Continue to cook, stirring constantly, until butter is dark golden brown and has nutty aroma, 1 to 3 minutes. Remove the skillet from heat and stir the remaining 4 tablespoons of butter into the hot browned butter to melt. Transfer to the bowl of a stand mixer and set aside to cool for 15 minutes. While the butter is cooling, adjust oven rack to middle position and heat oven to 350 degrees. Line 2 baking sheets with parchment paper. In shallow baking dish or pie plate, mix the granulated sugar and 1/4 cup packed brown sugar until combined; set aside. In medium bowl, whisk together flour, baking soda, and baking powder; set aside. Add remaining 1 3/4 cups brown sugar and salt to bowl with the cooled butter; attach paddle and mix on medium-low speed until no sugar lumps remain, about 30 seconds. Scrape down sides of bowl with rubber spatula; add egg, yolk, and vanilla and mix on medium-low speed until fully incorporated, about 30 seconds. Scrape down bowl. Add flour mixture and mix until just combined, about 1 minute. Roll two heaping tablespoons of dough into ball between your palms, roll the ball in the sugar mixture, and then place it on the prepared baking sheet spacing the balls about 2 inches apart. Bake one sheet at a time until cookies are browned and still puffy and edges have begun to set but centers are still soft (the cookies will look underdone, but you don’t want them to get overcooked and crispy), about 12 to 14 minutes, rotating baking sheet halfway through baking. Transfer the baking sheet to a wire rack and let the cookies cool on the sheet for 5 minutes. Using a wide metal spatula, transfer the cookies to the rack to cool completely. Enjoy!